Rapidly increasing bandwidth demand and customer expectations for on-demand services are creating challenges for carriers as upgrading legacy network hardware is costly, complex, and inefficient. Built for yesterday’s less dynamic internet traffic, hardware-based BNGs lack the scalability, agility and performance needed to keep up with rapidly growing bandwidth requirements. NoviFlow and netElastic solve this problem through a disaggregated vBNG solution that combines NoviFlow’s high-performance SDN switches and netElastics’s virtualized BNG software. 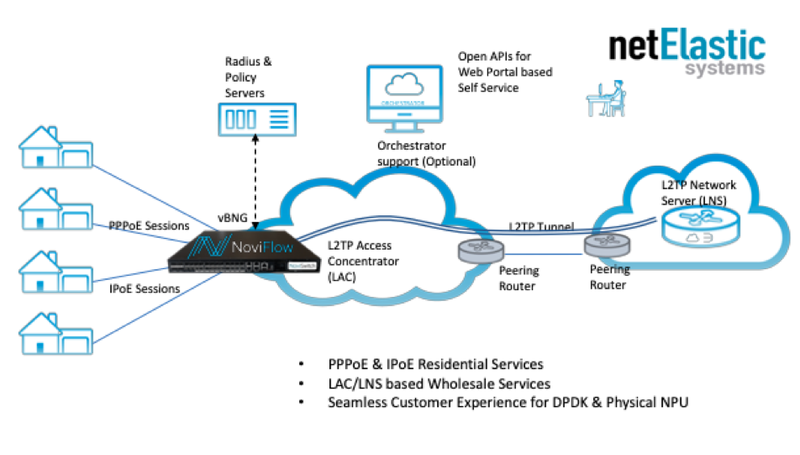 The joint solution helps carriers meet (and benefit) from exploding bandwidth demand and changing customer needs by providing a best-of-breed Virtual BNG (vBNG) solution that combines the fastest fully-programmable forwarding planes in the market, Noviflow’s NoviSwitches, with netElastic’s massively scalable vBNG.